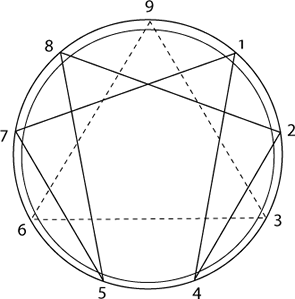 Each of the nine points around the circle embodies a primary personality Type. No Type is pure. Each Type is influenced by its dominant Wing which modifies the qualities of the primary Type imparting traits of its own. To this is added the influence of the motivating or Basic Need. A further distinction is represented by the level of maturity reached by the individual, this governs the person’s attitude and reaction to circumstances and events. Can you identify with any of these Nine Primary Types? The ONE: Conscientious with a strong moral sense of right and wrong. They are organised, disciplined and critical if their perfectionist standards are not met. However, they can be impatient and resentful with repressed anger lurking beneath the surface. The TWO: Warm and friendly with a concern for the welfare of others, which often leaves them with little time for their own needs. They are attracted to caring professions, such as social work, teaching and nursing. They can also have a tendency to be possessive and manipulative. The THREE: Self-assured, attractive and charming with a strong competitive streak. Being well turned-out is important for their self-image. However, their goal-driven ambition can take over to the exclusion of all else, even family and relationships. The FOUR: Sensitive, romantic and emotionally honest, view their experiences as opportunity for growth. They need to express themselves usually through some form of art. Hypersensitive or self-indulgent, prone to melancholy, envy or withdrawing into themselves. The FIVE: Energy goes into thought, curiosity and collecting information. They observe and remain aloof, protective of their privacy. However, this could result in isolation and eccentric behaviour and evenutally emotional detachment. The SIX: Reliable, hardworking, committed and friendly, yet an underlying anxiety makes them wary and ambivalent to relationships. Rebellion and defiance is their main defence leaving them insecure and over-anxious. The SEVEN: Optimistic, versatile in the search of excitment and novelty. Impulsiveness can lead to scattering of interests and energy. Fun loving can be underscored by superficiality. They can be completely uninhibited and exploitive. The EIGHT: Protective, resourceful and exudes an air of confidence. They assume leadership in whatever situation they find themselves and can be magnanimous at their best. They have a need to control their space; this can make them confrontational and aggressive when threatened. The NINE: An easygoing type. Good natured, supportive and accepting of others they are the mediators of our society. Their energy is invested in maintaining peace and avoiding conflict, even at the cost of losing their own identity. They can be passive and stubborn, and when situations become unacceptable slip into denial.